The “Global Bio Conference 2017 (GBC 2017)” kicked off its annual conference for a three-day run at Seoul Intercontinental Seoul COEX Hotel in southern Seoul Wednesday. The international conference, hosted by the Ministry of Food and Drug Safety (Minister Sohn Mun-gi) invited a host of domestic and foreign experts to discuss the role of the biopharmaceutical industry in leading the fourth industrial revolution. 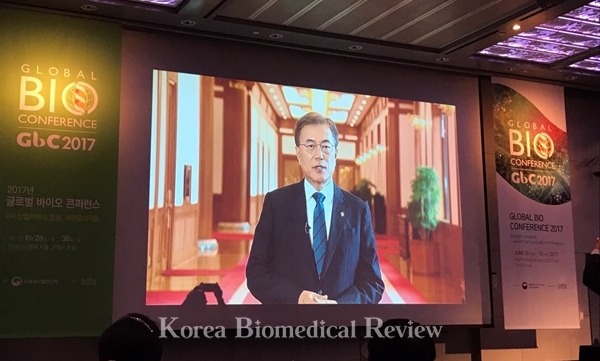 The conference opened with a commemorating video message from President Moon Jae-in, who noted that biopharmaceutical innovation such as cell fusion gene therapy, cellular gene therapy, and 3D bio-printing have garnered international attention and has the potential for becoming the next growth engine. President Moon Jae-in opens the Global Bio Conference 2017 at the Seoul Intercontinental Seoul COEX Hotel in southern Seoul Wednesday with a congratulatory remark. The international conference will offer special lectures by Korean and foreign experts, forums for biopharmaceutical sectors such as vaccines, cell, and gene therapy, and a special event for exporting domestic development products. Among the lecturers are Professor Lee Min-hwa of Korea Advanced Institute of Science & Technology (KAIST), Michael Goettler, Pfizer’s global president on rare diseases, McKinsey’s Axel Baur, IBM’s Michael Weiner, and UC Berkeley Professor Kim Sung-hou. The lectures will touch on a variety of topics regarding the progress of the biopharmaceutical industry in the fourth industrial revolution and the science of biopharmaceutical regulations such as artificial intelligence, induced pluripotent stem cells, and 3D printing. In one of such lectures, a multinational drugmaking company executive said the global pharmaceutical industry is on the verge of using medicine not to treat patients but to cure them. This paradigm shift “from treatment to cure” will take place over the next couple of decades, said Michael Goettler, head of the rare diseases division at Pfizer. Goettler pointed out that current science in healthcare is not treating the actual disease but its symptoms. For example, aspirin treats inflammation, not the cause of inflammation. In this regard, the expert pointed to gene therapy as the most likely sector to produce the cure, using as evidence the significant number of publications and human clinical trials being conducted in the field in contrast to other areas such as gene editing and RNAi. Even now, gene therapy can address genetic diseases in the eye, Goettler pointed out, which is feasible since the eye is small and therefore accessible for small, direct injections. Therefore, rare monogenic diseases will be the first to have cures within the next five years, followed by targetable rare diseases such as hemophilia and sickle cell disease, difficult rare and targetable non-rare diseases, and finally ending with moderately difficult non-rare diseases. “Towards the end, we will find the cause for all. We will find a cure that will trick the brain to produce its dopamine, and trick the body into creating its own medicine,” Goettler added. In this regard, Korea excels as a single payer system, Goettler noted. “This is not good news for other countries that have a multi-payer system such as the U.S., where the system is not geared towards providing united healthcare for the entire nation,” he said. Fore more details, visit the website of GBC 2017.